Vedic Yajna (Yajgya or sacrifice or ritual) is performed for the prosperity of human race through peaceful co-existence with nature by energizing the various forces in nature – especially sun. Agni, fire, that represents Sun, the Prathyaksha Brahman or Visible God, in Sanatana Dharma, is worshipped during the Yajna. This vedic ritual is known as Athirathram and is one of the world’s oldest surviving ritual. The 12-day ritual begins on April 4, 2011 and ends on April 15, 2011 at at Panjal in Thrissur District in Kerala. The saddest part during a Vedic Yajna today is that often the spiritual meaning and traditional values associated with it are buried beneath superficial things associated with the yajna. Vedic Yajna is not performed for miracles neither are they meant to invoke any deity and achieve materialistic gains. 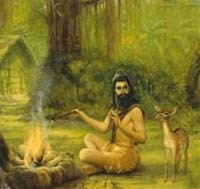 All Vedic yajnas are aimed at propitiating various elements in nature – a deep understanding that the existence of human race depends on the elements in nature. The very same energy that is in Sun is found in all living and nonliving beings – realizing this Supreme Truth is Moksha or Liberation. Athirathram is performed very rarely in modern times – the reasons are many – two of the most important reasons are money and sacred items required for the yajna. Athirathram is part of the Srauta ritual and showcases the oral tradition the great learning of the three Vedas (Rig – Yajur – Sama) and their supplementary texts. Namboothri Brahmins in Kerala have been keeping the Srauta Tradition alive from the Vedic times to the present day. It is they who perform the ritual. In modern times, three of the previous Athirathrams were held in 1975, 1990 and 2006. Putillattu Ramanajan Somayaji will be Yajamana or the high priest of the Panjal Athirathram. To learn more about Panjal Athirathram 2011 – you can visit the official website here.